On this screen, you will be able to view, edit, cancel and download open purchase orders and can view, return and download the received PO. PO ID : Please enter the PO ID if you are looking for a particular PO. Vendor Name : You can search the Purchase Orders for a specific vendor. Please select the vendor name here. 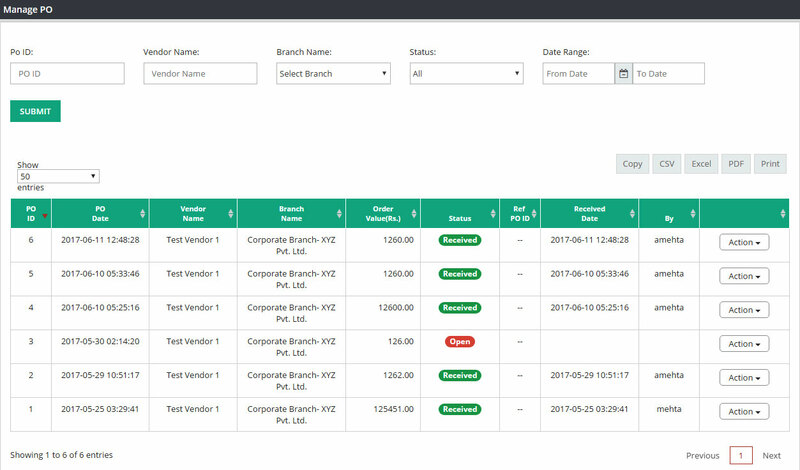 Branch Name : If you are a multi branch company, please select the branch name if you want to see the purchase orders for any particular branch. This field is not applicable for single branch company. Date Range : If you want to display the purchase orders for a specific time frame, please enter start date and end date in date range field. Once you are done with sorting, please click on SUBMIT. PO ID : This column will display Purchase Order number. Vendor Name : Name of the vendor who is selling the goods to you. Branch : Name of the branch. Order value : Total amount which you need to pay for this purchase order. Status : Status column will display whether this PO is in open, received, canceled or return status. Ref. PO ID : If there is any reference number associated with this PO, this column will display that information. Received By : User ID of the person who marked this PO as received after receiving the goods. View : Through this option you will be able to view all open, received, return and canceled PO along with vendor, product and amount details. Edit : If you want to edit any open purchase orders, please select edit option, it will take you to the screen where you will be able to edit that PO. Please note that edit option is only available for open purchase orders. Once it’s in received status, editing is not allowed. Download : Using this option, you will be able to download all received and open purchase orders. Cancel : You can only cancel open purchase orders. Return : If you want to return any product after receiving it due to bad quality or any other reason, please process a return order against original received PO.